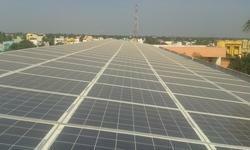 Leading Manufacturer of solar power plant for industries from Coimbatore. we are specially designed solar power plant for industries like foundries, machine shops, manufacturing plants and IT companies. we can give competative price and best quality products. we provide one year free service and payback assistance. we have good customer feed back. Looking for Industrial Solar Power Plant ?